The company says previous announcements about Android Nooks being discontinued were misinterpreted. Along with its Fiscal 2014 First Quarter Financial Results, Barnes and Noble has confirmed its commitment to producing both black and white ebook readers and Android tablets. This despite earlier reports that the company would only pursue its black and white ebook reader line. The misunderstanding apparently stemmed from the statement that B&N would look for a partner to perform the manufacturing side of new color devices. This is apparently true though it intends to continue designing and developing the new devices itself. As strange as this apparent misunderstanding is, the fact that B&N waited over two months to make their intentions clear is a surprise. Although the recent change in leadership of the company may certainly have something to do with it. In any case, Nook tablets are here to stay, and apparently so are the low prices. 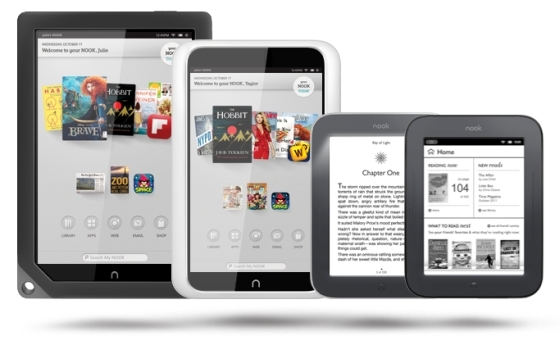 The new Nook sales strategy is to sell larger numbers of lower cost products. At their current prices, the Nook HD and Nook HD+ are certainly very reasonable choices for small tablets, especially since they now have access to Google Play. It's also safe to say the prices won't drop too much more now and it might be time to pick one up. At least one new Nook product is expected to be launched by the end of the year (most likely not an Android tablet), and several more are in development.